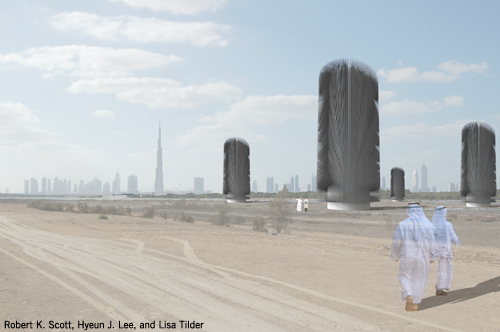 By employing an innovative system of electrostatic harvesters, we harness energy from a resource that is native to Dubai: sandstorms. 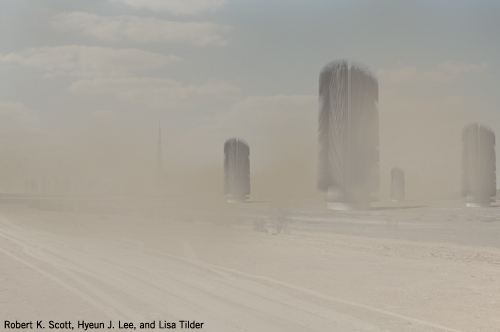 The process begins when airborne particulate from a sandstorm moves against polypropylene coated metallic rods. These rods collect a static charge in much the same way as a child’s balloon becomes charged when rubbed against her hair. Each of these rods are connected to a wiring harness that transfers the charge to a bank of capacitors, which then charge a large underground battery. The harvesters are positioned in a dispersed field set within the desert terrain. The site will not be invasively planted, and will be left free to grow whatever native plants take root. It will take a future form of its own choosing that embodies the authentic character of Dubai. Within the larger field of electrostatic harvesters are five occupiable ones, dedicated to each of the five daily salawat. Inside of these are spaces for quiet reflection and prayer. Here, members of the Islamic faith may practice, while other visitors are free to observe the beauty of the harvesters, be moved by the spirituality of the interior spaces, and experience Dubai in its most genuine, unadulterated form. The site is located along the Ras Al Khor Wildlife Sanctuary, with a clear view of the Dubai financial district. From this vantage point, visitors to the area will be left to contemplate these two competing skylines. One represents excess and invasiveness, while the other suggests minimalistic intervention coupled with a celebrated cultural identity.